During WWII in Italy, a regiment of black pilots flies with outdated P40’s to perform meaningless assignments, because the white army top management doesn’t believe that a black fellow man is intelligent enough to perform real actions. As in the American Civil War they were seen as pure cannon fodder. In the end they can prove themselves after all. Mix that with a love story and you have “Red Tails“. I thought it was a highly entertaining film with a lot of action and in my opinion nevertheless impressive air battles. In other words, I wasn’t bored for a moment. It’s not a top-notch film, but on the other hand it isn’t a flop either. The strange thing is that on IMDB you can read totally different opinions of people who actually should know it. 1. 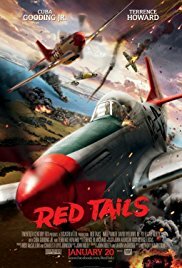 As a retired USAF Fighter Pilot, having flown 100 missions as an F-105 Wild Weasel over the hottest areas of North Vietnam, and recipient of the Silver Star, the Distinguished Flying Cross, and ten Air Medals, I found the movie to be excellent. 2. I am a pilot in the Air Force.This is by far the absolute worst movie I have ever seen. 3. I’m a former US Air Force F-4 Phantom Weapons Systems Officer (backseater).You know this movie is crap when you start with a supposed fighter squadron commander who doesn’t know the difference between a SQUAD (thirteen infantrymen) and a SQUADRON (48 fighter pilots). If they don’t know it, who does ? Maybe it isn’t technically accurate, but entertaining it was.